The EU ETS was launched in 2005 as the world’s first international installation-level ‘cap-and trade’ system for reducing emissions of carbon dioxide (CO2) in a cost-effective manner. It now covers more than 11,000 installations in 31 countries, and around 1,000 of these are in the UK. By 2020, emissions from sectors covered by the EU ETS will be 21% lower than in 2005. This will be achieved by placing and reducing a ‘cap’ on the total emissions, and corresponding emissions allowances available, in the scheme; driving cost-effective emissions reduction. 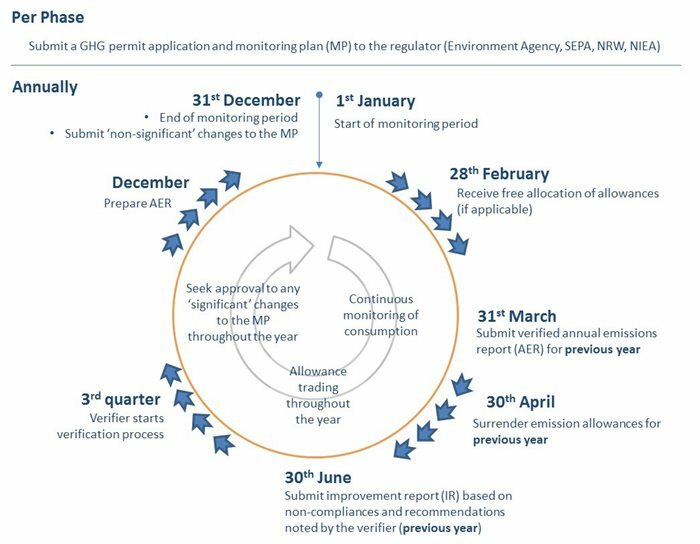 Since 2013, EU ETS installation operators have been governed by the national transposition and implementation of the EU ETS Directive and two ‘new’ EU regulations: the Monitoring and Reporting Regulation (MRR) and the Accreditation and Verification Regulations (AVR). The UK’s Greenhouse Gas Emissions Trading System Regulations 2012 requires all operators that carry out an activity covered by the EU ETS to hold a valid greenhouse gas (GHG) emissions permit. It is important to note that it is the ‘capacity’ of an installation, not its emissions, that determines inclusion in the EU ETS. Some UK operators are included in the EU ETS solely based on installed back-up generation equipment, where annual emissions are typically less than 20 tonnes of CO2e – so it’s important to assess inclusion in the EU ETS regularly, and especially if changes occur on site.